If you have output files that you produce every day, and you need to consolidate these every week, one approach is to produce a file with a unique identifier for each day. An example will be: BILLING.TRANSACT.DETAILS.Y2011.M0411..
You will need to change the JCL every day if you want to access the most current file. z/OS has a simpler way to do this. You can define a GDG called BILLING.TRANSACT.DETAILS and say it will have seven generations. As you create a file, MVS will create one generation. 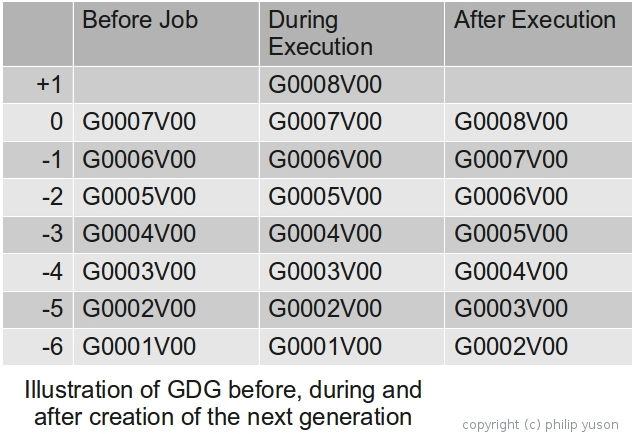 Each created file is added as a generation to the GDG. 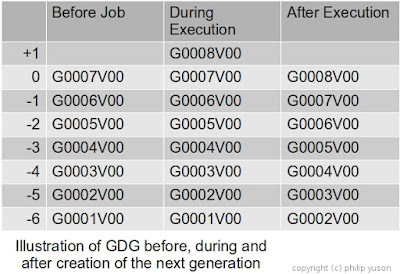 So if you created seven files, there will be seven generations to the GDG. In this case, if you defined seven generations as the maximum, you will always have seven generations. When the limit of generations has been reached, in our example, seven generations, the oldest generation will roll off the GDG and a new generation will be created. There are several ways to use these files. One is to specify the absolute generation number such as DSN=BILLING.TRANSACT.DETAILS.G0002V00. The other way is to specify the relative generation. In this case, the current generation (G0008V00) has a relative generation of zero. The JCL to access this file will be: DSN=BILLING.TRANSACT.DETAILS(0). DSN=BILLING.TRANSACT.DETAILS(0). MVS will know that you want the current generation. If you want the previous day's file you specify the -one relative generation. DSN=BILLING.TRANSACT.DETAILS(-1). MVS knows it has to pick up the previous generation. When you create a new generation, you specify +one as the relative generation. DSN=BILLING.TRANSACT.DETAILS(+1). MVS knows this is the new generation. The file remains the +one generation until the end of the job where the +one generation will be the zero generation. DSN=BILLING.TRANSACT.DETAILS. In this case, MVS will pick out all the generations and use them as input. However, you need to be careful because MVS does not process the files on a first come first served basis (meaning from oldest to newest). MVS processes from newest to oldest. This becomes a problem if you want to process the records as they were processed. Say if you want to update records based on the oldest to the latest, specifying just the GDG base will cause an error. You define GDGs by using the IDCAMS utility.